Prices have hit rock-bottom for beef and lamb. Farmers are in despair. It’s 1998 and BSE has shattered consumer trust while government advice is that they must ‘market their way’ out of the crisis. But how? They are not retailers. Disheartened and angry, Jim Fairlie, a Perthshire sheep farmer, packs the camping gear and goes to France for a holiday with his family. He hopes to come back restored and relaxed. He returns instead with a ‘fire inside’ which has been lit by visits to local French markets. It’s a eureka moment: Scotland’s farmers must sell their own produce in their own markets. His wife calls him ‘obsessional’. He thinks he’s just determined … and maybe a wee bit obsessional at times. What is certain is that to make this revolutionary leap back, to a time when every town in Scotland had its own produce market in the square, would be an extraordinary feat – if it could be done. Though he was born a ‘tounie’, after 20 years as a shepherd he had become a ‘teuchter’. He saw that tounies needed to know the truth about what the teuchters were selling. What had gone so badly wrong, in the industrialised food industry and multiple-retailing revolution, was the culture of deceit and rip-off which had developed. Trust had to be restored. Who better to restore it than the primary producers? The downside of being born a tounie was that Fairlie didn’t really know a lot of teuchters. A stall in the middle of Perth with him selling his own lamb would not make a market. Some teuchters were cautiously encouraging. A band of stalwarts, including Ian Millar of Jamesfield Organics, Irene Alexander of Bellfield Organics and Andrew Johnston of Hilton Wild Boar stood by him. He negotiated with the council and environmental health. Dug his heels in against ‘event markets’. It had to be a monthly farmers’ market if it was to become an integral part of Scottish life. 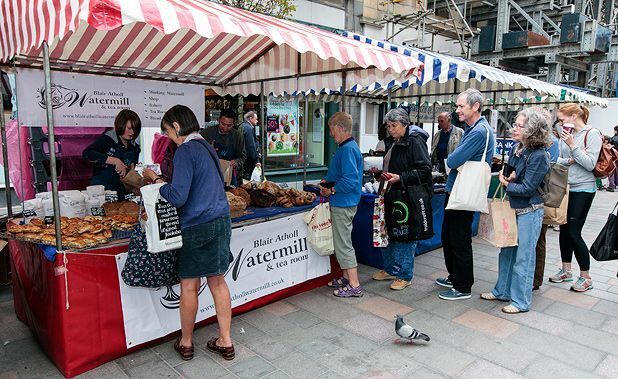 In April 1999, Scotland had its first farmers’ market.